Desert scorpions and bark scorpions are the 2 scorpion species in the Las Vegas area. Desert scorpions are primarily found in the desert away from neighborhoods and don’t enter buildings very often but bark scorpions on the other hand do. 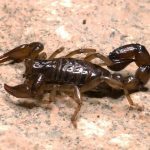 Bark scorpions aren’t even native to the Las Vegas, NV area but were originally shipped into the area on palm trees delivered from Arizona and Mexico. Bark scorpions are excellent climbers and will commonly be found on walls or on the side of houses and buildings. If your neighborhood has palm trees chances are you might have a bark scorpion problem. Bark scorpions have a painful sting to humans but it is not a deadly sting. We offer night service for scorpions at your residential or commercial property in Las Vegas, North Las Vegas, Henderson, or Boulder City, NV. After a scorpion service, we can show you the actual scorpions we were able to find. Liquid pesticides once dry will not have much of an effect against scorpions so it is best to kill them as you see them. We offer a night visit when the scorpions are active and hunt for them using a black light so we can see them. Scorpions show up as a neon green color when the black light shines on them. We will also do a perimeter treatment for general pest control at the time of the night scorpion service. An indirect way to get rid of scorpions is to have a regular pest control service during the day which will eliminate the scorpions’ food source because scorpions feed on other insects. If a bark scorpion has no food to eat they will die naturally or will travel away from your yard in search for food. PEST CONTROLScorpions are predatory arthropod animals of the order Scorpiones within the class Arachnida. Scorpions are common household pests. Most of the scorpions that enter dwellings are not venomous, and their sting is similar to bees or wasps but some can be deadly. It’s usually better to assume that they are venomous if you are unsure. OUR WORK IS GUARANTEDWe accept all credit and debit cards!